I'm posting this on behalf of member Longarm. Is the red bag shown here the Everlast 4210? the 4210 is an 11x8 bag. Yes, that is an Everlast 4210. 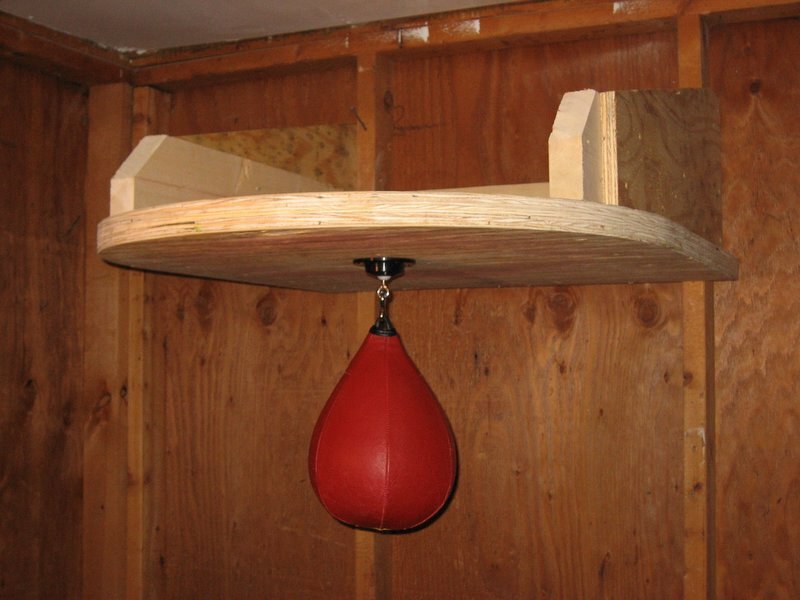 It is my first and only speed bag. I bought it sunday afternoon (two days ago) and brought it home and made that platform for it. Took me about an hour. I started working on the bag sunday night and tuesday evening I could beat a simple two handed triplet rythm for about half a minute. I really expected it to be more difficult, but with a big bag like that it was pretty easy. I also expected it to be weird because it's not very round, and you can see that in the photo, that's not an illusion, but it seems to bounce just fine. in your picture it looks a slight bit warped toward the upper right side, just about the belly. but I've had good luck with that particular bag (4210) punching out of it and assuming the correct shape. This 4210 red bag was used in all the technique pictures you see here on my website. How is it bolted to the wall? My platform is a crappy $60.00 piece of junk, but I put a big weight on top of it to reduce vibration. I just got a 6x9" bag because the bag it came with was bigger than the board. I would love to know how your homemade platform is working out for you. Nice setup. I can tell just by looking at it that you probably get no vibration at all!! I'm going to try and make something like that. Just look at my platform and you'll see why. It's such a flimsy setup. Oh well, its my first platform so we all gotta start somewhere. Thanks for the motivation!!! It's very helpful for everyone.